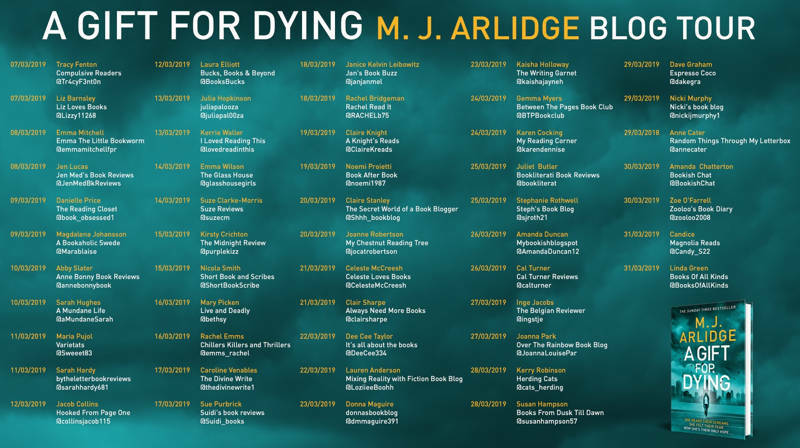 I’m so pleased to be taking part in the blog tour for A Gift for Dying by M.J. Arlidge today. I’m reviewing the book further down this post. My thanks to Tracy Fenton from Compulsive Readers for the place on the tour and to the publishers for providing me with a review copy via Netgalley. A Gift for Dying is a standalone thriller by the author of the Helen Grace books. I was immediately taken by the unusual storyline, that of a young woman, a 15 year old in fact, who believes she can see the manner of a person’s death from simply looking into their eyes. This is burden enough, but one day Kassie bumps into a man and when she looks into his eyes she sees a most terrible death for him at the hands of a murderer. Not only that, but his death is imminent. Kassie’s reaction to the man is extreme and disturbing. Well, wouldn’t your reaction be the same if you saw a vision of a man being murdered in the next few hours? Indeed! Enter Adam Brandt, a psychologist brought in to deal with the fallout of that bump and Kassie’s behaviour. The two form an unlikely alliance as Adam (kind of) believes Kassie when everyone else thinks she’s either crazy or making it up. Eventually there are more murders and every time Kassie manages to predict them, but she also manages to always be there, bringing her to the attention of the police. I wasn’t quite convinced by how Kassie always managed to just be in the right place to see the victims just before their murder but it’s a minor issue and not one that spoiled the story for me. 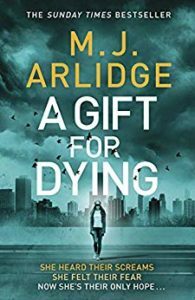 A Gift for Dying is a fast-paced thriller with short chapters that make it so easy to just read another…and another….and another. I did feel like this book was a tiny bit on the long side but those short chapters certainly helped to keep up the tension. This sort of storyline isn’t always easy to make plausible but I think Arlidge manages to do so very well. Be warned, this book is fairly gruesome and there’s no holding back on the gory details. Perhaps not one to read in bed at night! It’s really well-plotted though and I practically inhaled the last 20% or so. I just needed to know how it was all going to end. Overall, this is an ideal read for thriller lovers and it has a hook that makes it stand out from the others. Thanks for the warning! 🙂 Great review! Can you believe I’ve never read anything by M.J. Arlidge? I do have a couple of books on my TBR, though! Do you think this one could be a good start? Thank you, Meggy. I’ve only read this one and the first Helen Grace book. This one is standalone so could be a good starting point, rather than embarking on the first of a series.